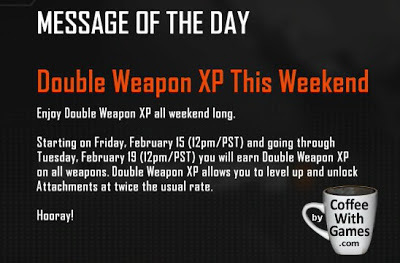 Coffee With Games: Call of Duty: Black Ops 2 Weapons Double XP Weekend! I totally did not see this article this weekend, but I was gone for a good chunk of it and also told myself I was going to give the iOS games and Black Ops 2 a break for a week or so. I have a handful of new games I picked up cheap over the weekend, so I wanted to get into some of those. It it turning into a busy gaming month. It's kind of weird how I have fluctuated with the Call of Duty games. World at War was played a ton. Black Ops not so much. Modern Warfare 3 a decent amount. Black Ops 2, A LOT in the last few months. It seems like they really try to keep things balanced...the only thing I hate is when people bring their KNIVES to a gunfight! I lose to them quite often....it's like they just eat the bullets or something. Haha - I created a knife class I called 'ninja' - just for something different every five or 10 plays, though my weapon of choice has definitely been the 50 cal sniper rifle that I have gold and all unlocks for. What I like about Black Ops 2 is the customized loadout. There is some serious flexibility in that bad boy. As for zombies, I haven't played that or the single player yet. I should probably do the story soon - I beat the original black ops story, so I might as well do this one. I hardly ever played zombies in the first black ops, where as my son played toooons of it. I know I saw him on wave 25+ several times on that. Sometimes he'd go it alone, but usually he would play online. He is playing zombies in Black Ops 2 and he likes it - but he says it's not quite as fun as the first black ops. he also did the season pass on it for all of the dlc, so he has that coming next week and the nuketown unlocks, which are pretty cool.